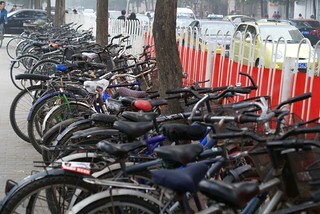 Beijing was well known during past time for a city full of bicycles. It was during a long period the most popular way to move from one point to another as the city is really flat. Today, the amount of bikers reduces a bit as cars, scooters or electric bikes are more popular. Spring just started couple of weeks ago; I had the chance to enjoy, as a passenger on my friend’s electric bike, Beijing streets with a nice weather and my desire came back again. 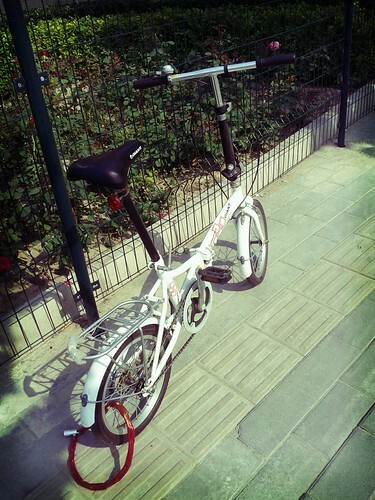 After few runs on it, it is clear that riding a bike in Beijing is incomparable to any known experience in Europe. Firstly, my wheels are so small that I can forget to go fast. 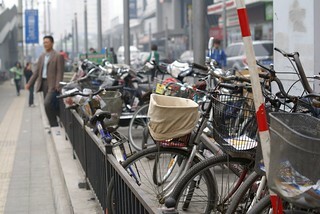 Then, even if lots of bicycle paths are available, the traffic is uncontrollable. Several people are going on the wrong way; cars are parked everywhere or even cruise in the paths… Of course, nobody follow the traffic rules and I need to pay attention at each cross-way and any car horn. It seems that to be considered as a real Beijinger, you should have your bike or scooter robbed at least one time. Interesting topic for a next post?